What are the new features in Visual Studio 2012? Microsoft Visual Studio 2012 is the latest version of Visual Studio. After Visual Studio 2010, Microsoft is coming up with loads of new and advanced features for Visual Studio 2012 also called as Visual Studio 11(version no.). If you are interested in knowing more about the new features of Visual Studio 2012 read this article to find out about the latest features of Visual Studio 11, price of Visual Studio 2012 and how to install Visual Studio 2012. Microsoft Visual Studio 2012 has amazed its users with its stunning new features. Whether your project is big or small Microsoft Visual Studio 11(Visual studio 2012) would help you turn your thoughts into software, fulfilling all the requirements of your project. Compared to the previous version Visual Studio 2010, the latest version 2012 brings loads of new features. Visual Studio 2012 RC is an upcoming version of Microsoft Visual Studio. Officially the developer preview version was officially published on Microsoft's official website on 16th September 2011. Visual Studio is an Integrated Development Environment introduced by Microsoft to facilitate software development. The IDE is a collection of tools that can be used for developing window, console, GUI and web application. It is widely used for developing web sites and web services too. The IDE is primarily composed of a designer, a code editor and a debugger. The latest version of Microsoft Visual Studio that is coming up this year is Visual Studio version 11, commonly called as Microsoft Visual Studio 2012. Microsoft has launched the preview version of Visual Studio 2012 RC on 31st May 2012. Like the other previous versions, Microsoft Visual Studio 2012 would contain a designer, code editor and a debugger. The Visual Studio designer consists of several design tools that aid in the designing of Window form based applications, WPF applications, Web applications, Classes, Database schemes and mappings between database and classes. However, in case of Visual Studio 11, Microsoft has announced that it would not support the development of desktop applications and users would only be able to develop Metro Style applications. The code editor of Visual Studio 2012 is where the main coding is done for the application being developed. The code editor would include IntelliSense which facilitates automatic code completion and suggestions for variable, loops, methods, functions and other queries. This IntelliSense provides suggestion not only for the included front end languages but also for Java Script, XML and CSS. Some common features of a Visual Studio Code Editor are collapsing code blocks, setting bookmarks, incremental and regex search, multi item clipboard and task list. Another interesting and important feature that is included in Visual Studio 2012 too is the background compilation. Whenever a developer types some code in the code editor, Microsoft Visual Studio starts compiling it in the background so that it can point out the syntax and compilation errors. The errors are then displayed with a green underline. Visual Studio 2012 debugger helps in debugging both at source level and machine level. Usually it is launched when a running application crashes. To trace the errors users can set breakpoints and watches. The debugger provides functions like step in, step over and step out for debugging the code blocks according to the need of the user. An interesting feature supported by Microsoft Visual Studio 2012 is Edit and Continue, which facilitates editing while the debugging is going on. This feature was not present in the earlier versions of Visual Studio. Visual Studio 11 like the previous version supports multiple coding languages through the built in language services. It supports Visual Basic.NET, Visual C++, Visual C#, Visual F# and Java Script. You should have a system powered by a fast processor 1.6 GHz or more. A RAM of 1 GB would be required and in case of virtual machines atleast 1.5 GB RAM would be needed. A DirectX 9 video card would be needed to run applications with a display resolution of 1024x768 or higher. The hard drive should support a frequency of revolution of 5400 revolution per minute. The system should support a 32 bit(x86) or 64 bit(x64) architecture. 2. Windows Server 2012 RC, Windows Server 2008, Windows Server 2003 and earlier versions. Microsoft Visual Studio 2012 RC has come up with loads of new and advanced features. We have here tried to list some of the new features of Visual Studio 2012 which were not present in the earlier releases. Metro Style Application is a new term for all the existing developers who work on the .NET technology. So you must be wondering what is a Metro Style Application. Metro Style Applications are nothing but the newly designed window applications that are particularly designed to be compatible with the new Windows 8 OS. 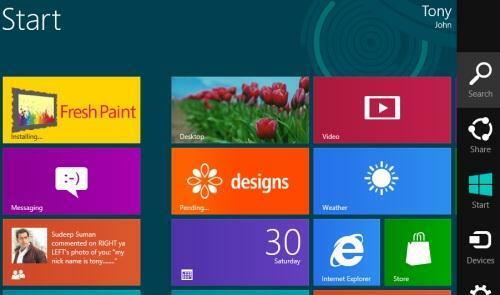 Unlike the old windows applications, these latest metro style applications are more powerful and more attractive. You can now create metro style app very easily and efficiently using the new Visual Studio 2012 IDE. The main focus of metro style applications is on the content. The whole screen in these applications is dedicated for the user content without any diversion of the user focus. They are specially customized according to user needs, devices they are running on, touch interactions and user interfaces. They support multi touching features that means that the applications can respond to 2 or more points of contact on the touch pad of the device. Visual Studio 11 is based on the new .NET Framework 4.5. The .NET Framework 4.5 provides easier and convenient ways to write codes for the new Metro style apps. It is much faster and hence the applications run at a faster speed. The asp.net start up is also very fast. The .NET framework 4.5 provides an excellent support to asynchronous program development. It provides a modern and easy access to the data in databases. It also supports the SQL server features, entity framework and web sockets to access data. 1. The first major change seen is the Ribbon Control. This control enables a ribbon user interface which consists of an application menu, toolbar for quick access and tabs. 2. For supporting synchronous and asynchronous data validation a new Interface is implemented. 3. The performance is improved considerably which is evident while displaying huge sets of data that is grouped. 4. Another major change that is observed in WPF 4.5 is improvement in item scaling. The time taken to load around 200000 items is just 2.3 seconds. Resizing code window in Visual Studio 2012: This new feature is an optional one which can be turned ON/OFF based on users choice. The code window automatically resizes and stretches itself to maximum from the three sides hiding the solution pane, output window, property window etc. The code window gets resized automatically only when the user is editing or selecting the code in the window. Google it button on error pop up window of Visual Studio 11 application: Most of us while coding come across several error messages, whose meaning or solution we don't know(apart from some common ones). Microsoft has thus provided Visual Studio 11 with an excellent feature where a new button 'Google it!" has been incorporated on the pop window of the error message itself. So now the developers can directly and easily connect to Google to find out the meaning and solution for all those errors they are unaware of. Advanced copy paste in Visual Studio 2012: Another feature that VS 2012 has come up with is some sort of sense that allows VS 2012 to rewire the copy pasted code which the developer might have picked from some other source. All we have to do is write the required stub, try and search the required code and copy it and paste on Visual Studio 2012 code window. VS 2012 will automatically detect similar components like variables, return values etc. from your stub and replace them in the pasted code which might otherwise not work on your code. Intellisense feature of Visual Studio 2012: When you'll start working on VS 2012 you'll notice there have been some real advancements made in the Intellisense feature to point out the bugs and errors in your code and to guide you through various events, methods and their sytax. Automatically add semi colons to code in Visual Studio 2012: Sometimes developers keep scratching their heads on errors while execution which have occurred due to very small mistakes like forgetting to put semi colon at the end of a line or forgetting to close brackets or braces. Visual Studio 2012 has now made everybody's life easier by automating the system of adding semi colons or brackets in case the programmers forget to do so, while it mentions it as a warning in the error list. Edit code while execution: Unlike the previous versions where users were not allowed to edit the executing code, Visual Studio 11 lets the users pause the process of execution or debugging and allows them to edit the code. The compiler then resumes taking in account the modifications made to the code. Long back a similar feature was present in Visual Basic 6 too. Translate Visual Studio 2012 code in different languages: As mentioned above VS 2012 supports multiple languages like VB, C# and F#. VS 2012 provides another great feature where one can translate the code written in one language to another language or style. Installing Microsoft Visual Studio 2012 Professional RC is very easy. All you have to do is download Microsoft Visual Studio 2012 Professional RC for free from the official website of Microsoft. Follow the given procedure step by step to install Visual Studio 11. Price of Visual Studio 2012 Professional with MSDN would be around $1,199 and without MSDN would be as low as $499. Have you tried these stuff? some features like Code window resize and evil code monkey doesn't work on 2012 RC. How to enable them? Edit and Continue was supported in previous editions. In VS2012 is still not supported for 64-bit applications.